Out on DVD this week is the surprise Best Foreign Language Oscar winner, “Lives of Others” - the first feature film from German director Florian Henckel von Donnersmarck (what a mouthful). It’s a terrific thriller and character study drawn from a time period so far under-exploited in film. It’s East Germany, 1984, the Berlin Wall is up and citizens are still under communist rule. Artists and their works are watched with scrutiny for subversiveness. Many great artists are blacklisted and not allowed to perform or create. In Orwellian fashion (hence 1984), the secret police, Stasi, keeps strict control on all activities of suspected conspirators. They are so determined and meticulous they collect samples of body odour from the seats of interrogated victims to have on file for future reference. 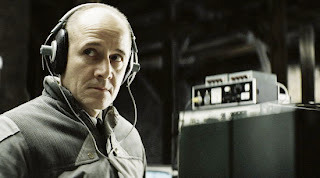 The best of the best of Stasi agents is Captain Gerd Wiesler, a robot-of-a-man, who conducts his interrogation and surveillance with unwavering determination. Wiesler is assigned the case of bugging the apartment of a talented playwright Georg Dreyman and his actress/wife Christa. Dreyman and Christa have been very careful with their work knowing full well the ramifications of counter-thought. They both know their work is compromised yet they still choose to conform. When Weisler learns his mission is a personal vendetta by the Minister of Culture, who is having affair with Dreyman’s wife, Weisler’s idealistic attitude about the job is shattered. His attitude shifts as he slowly moves to the side of Dreyman and his wife. Unknown to Dreyman, he silently becomes their guardian, covering up information, reading Dreyman’s books and lying to his superiors about their actions. When Dreyman writes an essay about the high suicide rates of East Germans, and manages to sneak it out to the West, Weisler must go the extra mile to protect them. The pacing up the film ramps up to ‘thriller-level’ in the cat and mouse game to find the anonymous writer. Once you think the film is over, it continues another 20mins for an extended denouement. Some may think it unnecessary or overlong, but it’s necessary to put the entire film into context. I’m reminded of Adrian Brody’s search for the German captain at the end of “The Pianist.” Perhaps it’s a bit of von Donnersmarck copping Spielberg (or Richard Attenborough, whom he apparently mentored under) at the end, but it’s also a heroic and satisfying respite in an otherwise bleak story. Enjoy. good movie but it was much too long for its content and plot- could have been shot shorter and instead provided with more intensity..